How quickly I forget. How quickly the words escape into the ether and my faith-filled experiences and my God-given confirmations become a distant memory. I have had my share of minor miracles and serendipitous encounters with wonder. I have felt the Presence of God. I have prophesied truths that I could not have known except through divine revelation. And yet, I forget. I lose myself in my circumstances and my fears and insecurities. To remember the stories of our past, we must talk about them. In this way, families develop beloved corporate stories that are passed through the generations. Their exactness is not as important as their intent, the feelings they engender, and the bond of memory. God offers us this opportunity through the scriptures and texts, the oral traditions put to paper were passed to us for our sakes. Through the prophets, the people were told over and over again, to remember. Today marks the fifth month of my husband’s death. Who he was and what he did and what he looked like are still emblazoned in my heart, but for the sake of the children and the children’s children, we must remember and share and talk about this man. And while we do this, let us remember as well, his unwavering faith that became a rock for our family together. 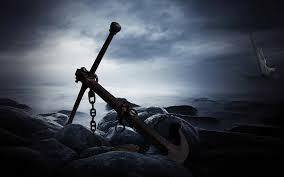 Mike was our family’s anchor; Christ, my soul’s anchor. These words occur in a very long passage in Deuteronomy that begins at Deuteronomy 6. In the original Hebrew, this passage (D:6) is recited first thing in the morning and at least once a day, frequently more often, as part of Jewish practice. In devout practice, it is accompanied by the wearing of tefillin, literally binding these commandments to the hand and the forehead, and every Jewish home has them “written them on the door frame” (mezuzah). It is the famous “sh’ma” which begins “Hear, O Israel, the Lord thy God, the Lord is One.” D:6 than continues with words that clearly describe Mike: “You shall love the Lord thy God with all thy heart, and with all thy soul, and with all thy might.” With the slogan “Be like Mike” his church pointed us to Galatians 6:9, a fitting description of how Mike translated Deuteronomy 6 in his life. It’s worth noting that this section of Deuteronomy is made up of multiple repetitions of the core instructions, and we are told over and over and over again, as though it was obvious that – as you have pointed out in an earlier meditation – there would inevitably be enticement to turn away from this path. Thanks for the additional historical info.